Gann Trend Oscillator was adopted from the book, "A W.D. Gann Treasure Discovered",written by Robert Krausz. This oscillator is a trend indicator that indicates whether the trend is up or down.In forex trading, this indicator can be applied to confirm the entry and exit signals. This is a range bound technical indicator moves within +1 and -1. A +1 reading indicates an uptrend, and a -1 reading indicates a down trend. Buy orders are suggested as long as the value remains +1. Sell orders are suggested as long as the value remains -1. 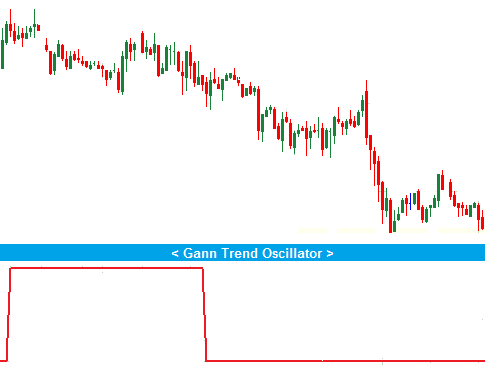 The Gann Trend Oscillator is not alone sufficient to take a trading decision rather it should be applied with Gann HiLo Activator and Gann Trend Oscillator indicators. These three indicators form a complete trading system called "New Gann Swing Chartist Plan". These are the core knowledge you require to apply the Gann Trend Oscillator in you forex trading. If you have any questions, suggestions or complements, you can drop a comment below.